Did you know that I love all things Polka Dots? Yep! AND...I love, love, love Ice Cream! So, this card was meant to be, right? I'll be that at least one of you is in the process of getting up to go to your freezer for a sweet treat! So fun! LOVING the ice creams!!!!!!!!!!!!!! Your ice cream treats look almost real, Patti...fabulous coloring on them. I nearly went for the hot pink choice too....it's a great choice for "summer" theme and your card proves it! Sweet card - pun intended. 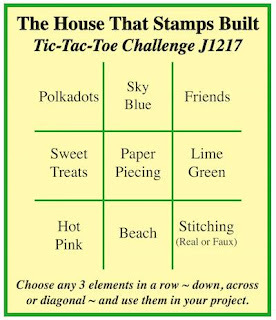 Love the polka dot paper and how you used it. This is too sweet Patti, great design, like that rick rack. What a cute sweet treats card and I love the ric rac trim too! Such a "sweet" card. The colourful ric rack is a nice touch. Stay cool! Great minds think alike - polka dots ice cream - pink - hmmm...and the ric rack is perfect for this card. I think we should indulge soon and go to Licks. Awesome card, Patti! It definitely makes me want a little ice cream. Mmmmmmmm love your card Patti, those ice creams look so tempting! Love this! Looks yummy! So pretty! I must say this is adorable! What a sweet and fun card. Love the bright and happy papers. 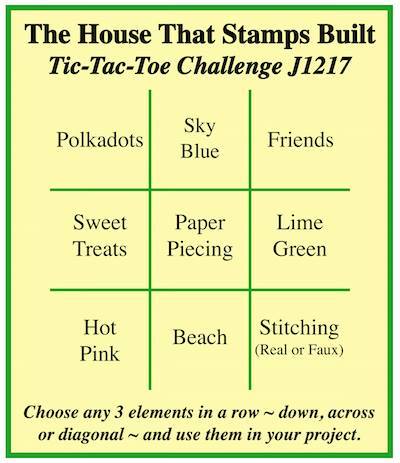 Anything Goes at 'The House that Stamps Built'!